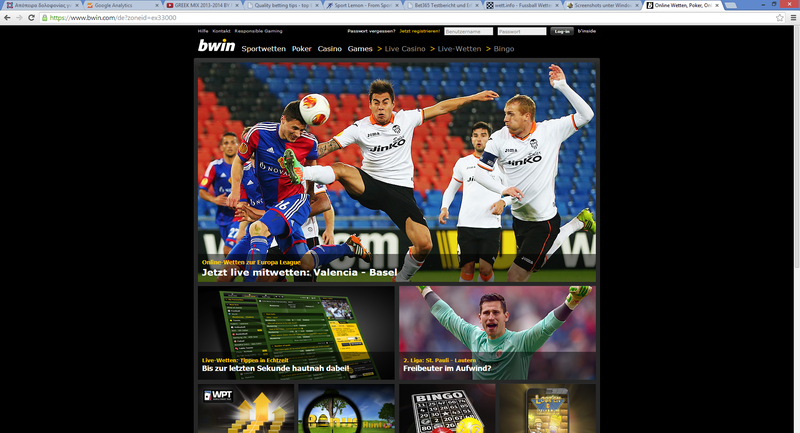 Bwin is one of first online bookmakers. It started as an austrian betting bookmaker and moved during the time moved to Gibraltar. Today it belongs to the biggest bookmakers and is sponsor of many top teams and national leagues. Bwin offer many casino games, sports book, poker and bingo games. The bonus on Bwin is maybe the best on the internet. For players who have Euro as currency receive a free bet in a value of 50 Euro. Players from the UK get a free bet of 30 pounds. If you receive the free bet this will be an additonal amount on your deposit. You can use this free bet without risking your own money. If you win you can keep your winnings and withdrawal it. If you lose you have not risk your deposit amount. The betting program and the offers on Bwin are very big. You can find matches to bet from almost every betting league. For every match you can find many special bets. The main sport on which Bwin is focused is football. For football you will find the most offered bets. Unless which team will win there are many special offers like handicap bets, goal scorers, corners, under over goals, both teams to score. It is hard to find a special bet that it doesn't exist but exist in an other bookmaker. Also for other popular sports like tennis, basketball and ice hockey there are many offered bets with great odds. As you can see even for players who like to try different things, Bwin has opportunities for them. Great is the livestream on Bwin. You can watch matches live and in an excellent quality for free. This is an advantage for live betting. When you watch a game with the livestream you can bet more successful on live betting. The imagination of the match helps you a lot to estimate the end result correctly. The players on Bwin have on their transactions the highest security. All transactions are secured with ssl. The deposits and withdrawals are processed very quick and no of the datas are given to third parties. You can be sure that your bets are in safe hands. The odds on Bwin are excellent and belong to the highest on online betting. The payout rate is about 94%. You will see this high payout on every match. Even for live betting you will have high odds. Bwin has a very quick support for the players. People can contact with e-mail or telephone. The response on the e-mails is very clear and are issues are answered. The support is offered in many languages and all the main languages are covered. The graphical interface of Bwin is even for new players very easy to understand. The matches are categorized in countries and leagues. So they are easy to find. Bwin has also search box. In the search you can type the team and all upcoming matches of this team are shown. The black background combined with the white color of the letters makes the Design very readable. Bwin gives high priority to make the usability easy for the players.